The following video shows Reverence going through the entire battle with Nightmare Pilgrim. There are some helpful tips placed during the video. I highly recommend you pause, the video when they come up and jot them down. Oh, and having music from Rob Zombie seems only fitting when taking down the Nightmare Pilgrim. How did the guild Reverence get its start? Reverence originally started from the EQ days, which branched into many other MMO’s, and finally came to The Old Republic. The guild founder Capex, started Reverence on the Wall of Light server. The guild then branched into both factions and multi servers, which created a member base of over one thousand at one time. When the Asian/Pacific realms launched, Reverence landed on the Dalborra server. Since Reverence is the majority Australians, most members moved over and it became the main guild in both factions. After the launch of Dalborra Reverence, Capex moved onto, and passed the leadership over to Striker (myself) and Jingin. What faction is the guild playing primarily? What led the guild to choosing this faction? Reverence is primarily the Republic faction, with a cross faction guild called Dark Reverence. The guilds primary goal was to have over five hundred active members with both factions combined. The Sith did not progress well on Dalborra and the server was majority the Republic. Eventually within a few months of the server launch, Reverence became the biggest guild on the server, and so lead to becoming the primary faction. Your guild is one that moved during the server transfers, how did that experience go for your guild? What is your new server and do you all like the new location? Reverence came from the Wall of Light server and moved to Dalborra, in the Asia/Pacific realm. When the Asia/Pacific realms launched, character transfers weren’t available for a few months after. So the members established the guild, and were well into operations before the transfer. After the transfer was available, many of the toons from the other server then became alts, as we were well into the game already. The Asian/Pacific realms suit Reverence very well and we enjoy the new location, as 99% of the guild is in region. How would the guild rate their experience so far in the game? Has it improved since launch? Since the launch of the server, Reverence has survived as the only large guild, with the other competing guilds disbanding. The experience you get in Reverence is being able to get into any game content that you like to. Reverence has many surviving members since the launch of the server, and has welcomed the merger of other guilds that lack the numbers that want to do end game content. Since the launch, Reverence has done many server first operations, and we continue to do all end game content. Reverence has improved with its leadership since the launch, with great officers and raid leaders, and has moved from one group completing operations to many groups completing them. What is the primary focus for the guild Reverence? 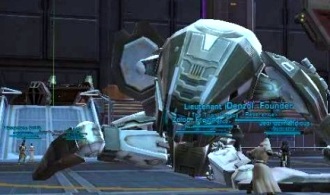 How has the guild found endgame progression and Operations in SWTOR? Reverence is a guild aimed at steady progression through end-game content. We are a tight-knit team that enjoys challenging ourselves, and pushing to meet new goals. The guild is not one person, or the officers, but rather the team of members as a whole. Members should conduct themselves with maturity and respect both inside and outside of guild affairs, as the actions reflect on the entire guild. Every member is important, and helps to shape the future of the guild, and its success. Reverence started out as a PVE/PVP guild, and has moved its primary focus to PVE. While other MMO’s come out, and the lack of new content to keep gamers interested, we focus on keeping the member base up with recruitment, while losing people and doing all end game operations on a weekly basis. The end game progression has been a fun experience and challenging at times. Reverence currently has four different eight man operations completing hard mode explosive conflict, and also completing nightmare pilgrim on a weekly basis. While we are currently only running several eight man operations, I would like to see Reverence progress into sixteen man operations very soon. Does the guild feel that there is enough balance in Operations that challenge players, but do not cause extreme frustration? Operations are challenging at first with the lack of experience and gear. It is also challenging running with new groups or people that you are not familiar with. The actual gameplay of the operations is balanced in my opinion, and the challenge is where it should be. The developers did a great job with this. It is the same experience in any MMO though, with new content, there is frustrations on wiping, however in time, you feel there is no challenge left after you can complete the hardest content without dying. Until new content is out, Reverence enjoys getting new members the raid experience, and completing hard mode Explosive Conflict. Hopefully the guild evolves into bigger sixteen man operations as well soon, with the joys of a challenge again. What do you think of the new Operation: The Terror from Beyond? Is the guild eager for more information and possibly a more definite time frame? Reverence is very excited about the new operation. A definite date and not just a time frame would be great. With the launch of Guild Wars 2 and the other competing MMO’s, the server and Reverence has and will lose members unless new content is put out. Not having any date to look forward to, makes the other games look appealing. The challenge of the new operation is going to exciting. With rumors of story mode being equal to the story mode of Explosive Conflict, however the hard mode being significantly harder than that same level mode Explosive Conflict, it poses a challenge that Reverence is very excited about. How has the guild done in the Operation: Explosive Conflict? Are you all ready for them to release the Nightmare mode? Reverence has four different eight man teams completing hard mode Explosive Conflict, with several members in the guild fully geared in campaign now. We have not attempted the sixteen man operation yet, but with several eight man operations completing on a weekly basis, we are very much ready for the nightmare mode. Hopefully it will be very soon. What is your main character class/advance class? How have you enjoyed the game so far? My main character is a Human Smuggler/Gunslinger named Striker. I switch from spec to spec sometimes, however my main spec I go with is 5/5/31 Dirty Fighting. I have always been a Star Wars fan, as well as a MMO fan, so I have enjoyed the game so far. However, I would like to see some content soon, as well as other things fixed. As being someone who wants to complete everything in the game, having broken codex/achievements is very annoying. The big news most are still talking about is the Free-to-Play option coming this Fall. How do you and the guild feel about this new model for the game? MMO’s are evolving to this, as it has been a steady decline in the gaming world. Even console games have not been producing like they once use to. Reverence members has different opinions about the new model, but we will just wait and see how things progress. If the new model makes the server more popular then I feel pretty positive about it. However instead of looking for a free to play model to get people interested, The Old Republic should be looking at constantly putting out new content, to keep people interested. MMO fans and gamers will pay for a good game that provides endless gameplay without being repetitive. If you feel like you have done all there is to do in a game, then you move onto another game. What is one thing Reverence would like to see improved, changed or added to the game? Reverence would like to see new content added to the game. It would also be nice to see in game dps/hps/threat meters, so that you don’t have to run third party programs. The codex system needs to be changed and improved along with achievements. Currently there is many planets that you cannot fully complete with a broken codex. A cross server queue for warzones and group finder would be a great improvement for the game, as well as a solo queue for ranked warzone matched. Is the guild Reverence currently recruiting? If so what classes/advance classes is the guild needing? Reverence always has open recruitment, although we don’t advertise in the chat. We open for any class, as we constantly make more operation teams to raid with. What steps do those looking to join the guild need to take? What is the best way to contact the guild? Should they go to your website or try and reach guild members in-game? The best step to join the guild would be to first visit our website, and apply on the recruitment application. New members must apply before getting invited into the guild. The next step would be to contact someone in game and ask to speak to an officer. Huge thanks to Reverence’s guild leader, Striker, for getting the responses to me, even during the holiday weekend. Also a huge shout-out to the entire guild and continued success as all of you journey in The Old Republic. Keep up the great job and all the best in whatever you do. Does your guild strive to for the highest level of progression or another aspect of SWTOR? Let us all hear it! So if are you in a guild or a leader of a guild, why not contact me, so we can share with the community about what you are doing. Just submit your guild’s website and some basic information in an email to me at, jason@corellianrun.com. Look forward to highlighting more guilds here at Corellian Run Radio. Thanks and see you next week! Operation: Information – Where’s the Content? Episode 71: PVP – Hot or Not?